ST-MSCM Motorized Type Fabric Pinking Machine is used to cut fabric samples with attractive zig-zag edges. 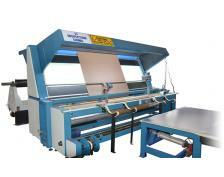 ● Effortless cutting of any fabric quality- far superior to hand operated machines. ● Precise and accurate thanks to right angle guide with milimeter graduation. ● Easy to operate, fast and powerful. ● Mobile, ready to use anywhere. Remark: Variable blade length is possible and can be tailor-made to your requirements of cutting needs. Durable alloy steel zig-zag serrated blade. A cutting mat is included for preventing the blade from damage during the cutting operation. Cutting table is scaled on one side to allow the operator to decide the size of cut conveniently and accurately.